It was only a matter of time before the conversions for Tamiya’a Gama Goat really started rolling in. Perfect Scale Modellbau out of Germany has jumped into the fray in a big way with not one, not two, but three conversion sets for the lovable Goat. Rather than focus on smaller corrections or PE type of aftermarket goodies they have opted for a much more noticeable approach with sets that add the hard top cab, the soft top cab as well as a canvas cover for the trailer, and a third set that is large and in charge, a S-250 Shelter. Each of the three Gama Goat conversions sets come packaged in a small but very sturdy cardboard box. The resin parts and castings are well protected with a bubble wrap cocoon inside that help to insure no breakage. None of my samples suffered any damage in transit whatsoever. The PE and decals are packaged in a separate small poly bag. Opening each of the boxes will leave you with a very positive first impression. Closer inspection will reveal no air bubbles, pin holes, or other common maladies of resin castings. The quality of the casting is consistent for each of the three sets; below I will attempt to lay out what you will get with each individual conversion set. The instructions in all three are a bit dodgy, but with the minimum number of parts it should not take more than a minute of study to figure out where everything goes. This set provides three large castings, two that are completely new and one that replaces the rather sparsely detailed engine cover from Tamiya. The two new pieces are the soft top cover for the drivers compartment and the canvas shelter cover for the utility trailer. The replacement piece is a new style of engine cover. The engine cover is a style that is unknown to me and doesn’t appear to be that common but it may be just what you are looking for if you are modeling a particular Goat. This cover is the same one used in Perfect Scale Modellbau’s earlier release of a resin Goat from a few years ago. It features horizontal channels across the top of the cover that the Tamiya part does not have. In addition it also sports a crossed set of what appear to be reinforcing strips on the forward facing end. Also, the cooling louvers are a slightly different arrangement, but alas are molded solid just like the Tamiya part they replace. The canvas cover for the rear trailer is even nicer, great detail that captures the look of stretched canvas perfectly. The snap details on the front and the rear are very nice, often a problem getting the resin pour to fill details like this out but Perfect Scale Modellbau nailed it. The front end of the cover features a very nicely detailed inner flap to close off that portion of the cover but the back end is open. Again, the only drawback is the lack of interior detail. To end on a positive note however it is again a drop fit unto the Tamiya kit. The small PE fret provides you with 14 tie-down hooks for the trailer. The decal sheet provides markings for several vehicles from the 1st Armored Division, 82nd Airborne and what I think is a 2nd Cavalry Regiment vehicle with V Corps (or, it may be V Corps, II Cav, as I could be reading the bumper codes incorrectly) as well as what may be a 1st ID vehicle but I am really fuzzy on that one (1-roman numeral 1 followed by a 3 with a triangle, so it may be 3rd AD, or it may just be an I Corps Goat, who knows) At any rate, lots of marking choices available. The hard top conversion provides, wait for it, and wait for it, that’s right, the hard top for the Gama Goat. The hard top comes with a separately molded roof piece and two small door handles. Again, the molding is top notch without any flaws whatsoever. The conversion also provides a new engine cover, the same as the one noted above with the soft top conversion. As well, the PE and the decals are the same as the soft top set and are described just above. The S-250 Shelter comes with a couple of large castings for the body and the floor of the shelter. Once you put those together you more or less have a shelter, the only thing to add is the front vent cover as well as a couple of door handles for the rear doors. The instructions leave a bit to be desired and are not very clear. Part #3 is the vent cover, it is not indicated where it is located, but the shelter is sparse enough that you can easily figure out where it fits inside the upside down U shaped bolted bracket face. Also, part #6 is not well marked; they are the door handles for the rear doors. The shelter is secured with a set of 4 turnbuckles attached to the four corners of the trailer; all the hardware is included as delicate resin castings. Take extreme care in removing each of the pieces from the resin casting plug. Besides the turnbuckles you also receive the chain links, each link is cast separately making construction a bit tricky. I think I would replace the resin chain with an appropriately sized piece of metal chain from the spares bin. 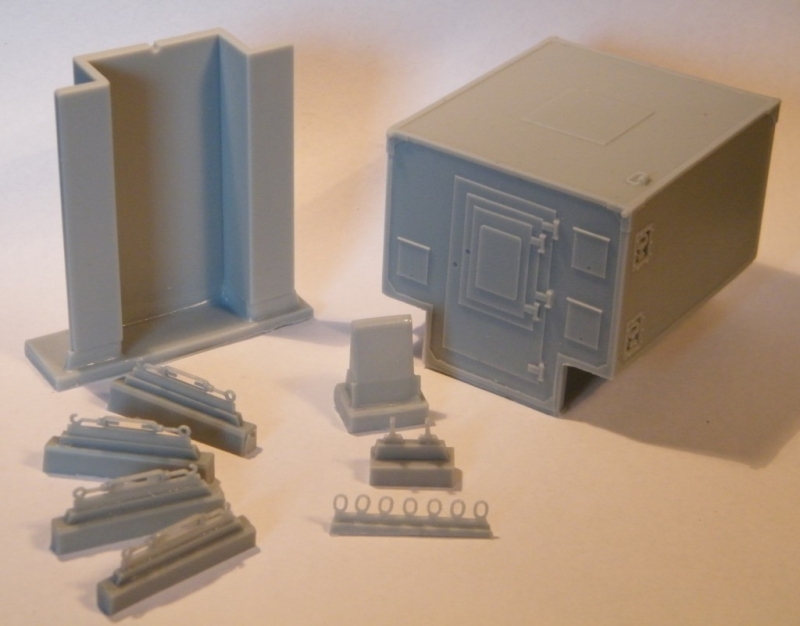 This conversion set is the most versatile of the three as the S-250 shelter can be seen on all manner of vehicles, Humvees, the M-1102 trailer, CUCV, or even in the bed of a Meng Hi-Lux for a unique model. The kit comes without any decals or the PE fret that the other two sets include. I went ahead and cleaned up the parts for the shelter and floor itself to check for any fit issues. The floor to shelter body fit was an easy five minute clean-up with a razor saw and an emery board for a nice tight fit. The shelter in the trailer was easy as well, however, the bottom rear of the shelter will need to be trimmed a bit for the trailers rear gate to be able to close. These three all look like solid winners that should go a long way toward dressing up the Tamiya Gama Goat. You could easily combine any two of these sets for an even more unique look; I am thinking of redoing my previously built Goat with the hard top conversion for the cab and the soft top for the trailer, should look great when it is done. I can recommend each of these conversions with the only caveat being that you might want to have a bit of experience with resin before tackling the S-250 conversion but only because of the separate links for the chain and turnbuckle. Highs: Great looking conversions for the Gama Goat. Resin castings are free of any imperfections. Great fit for all the conversions although the shelter does need a slight trim to enable the tailgate to clear. Nice selection of markings with the new decal sheet. Lows: Odd engine cover that I am not familiar with. Instructions are a bit hard to follow and the individual links for the chain on the shelter seem a bit much. Verdict: Highly recommended. any of these three will really dress up the Goat. I like that you can use any two of them for an even more unique model. Hi there, I got the canvas cover set and I am disappointed. First the contour of the cargo canvas is not correct. I could be mistaken from photos, but the front bow is going down straight and not curved as displayed. also, the thickness of the canvas cover is with about 2,5 mm (0.10 inch) way to thick. Second problem is the engine cover. The kit despicts the late engine cover made of pressed steel(the Tamiya kit has the early style aluminium cover). While the shape of the cover is good it is just 2,5 mm (0.10 inch) to short. Problem was that PSM`s resin Goat has serveral dimensional problems and these problems are simply carried over to the replacement parts. Sad but true. H.-H. Here we go again. I get so tired of people criticizing model kits. Heaven know no model company will ever produce an exact miniature replica of a vehicle in 1/35th scale. What most people fail to realize or accept is that if modeled to exactness, there is a lot of detail that would not even show up on a 1/35 model. Many time companies model detail over-sized or slightly inaccurate just so modelers will have the detail they think would be on the model. Yes the PSM kits are not completely accurate and I admit it would be nice if the rear canvas cover was not molded as thick as it is, but at least PSM has given us something to work with. The alternative would be to scratch build it yourself with plastic rod and tissue paper. While I'm sure I could accomplish that, not all modelers have the same skill levels or patience. Rather than criticize, why don't we thank companies for their efforts? If you still feel the need to point out problems or inaccuracies, then at least offer a solution or describe how you fixed the problem so that other modelers can profit from your experience. Then, others can decide if they want to accept the kit with it's problems, build the kit with your described solutions, or pass on the kit altogether. Just remember, that companies are in the business of making money. If we continue to constantly criticize their products, what is their incentive to continue producing kits, that they know they won't sell, because someone criticized it and because of that, others won't buy the kits. Okay, time to fall off my soapbox. Just my opinion, and we all know how personal opinions rate. If I stepped on anyone's toes, I'm sorry. Hint, hint: They should make those turnbuckels available seperately - many uses! Very nice! Very good review, Rick, thanks for doing this. The spirited discussion is good, as small companies like PSM try their best to provide us with products that fill voids left by the big manufacturers like Tamiya, who haven't provided an accurate or to-scale tarp for any kit of theirs I've ever seen.